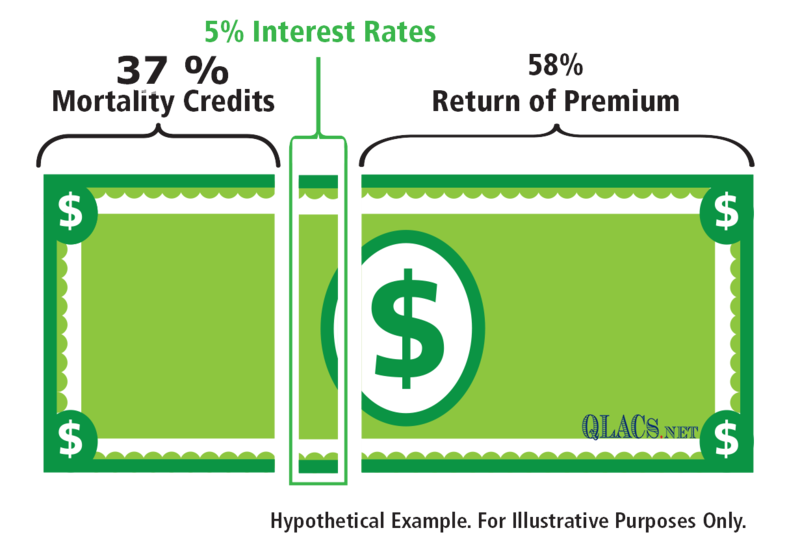 Why purchase an QLAC or longevity annuity when interest rates are low? refer to this as mortality credits or longevity credits and use them (along with your premium payments and current interest rates) to determine your lifetime payout amount. $10,000 per year. How is that payment calculated? Should you wait until interest rates rise to buy? 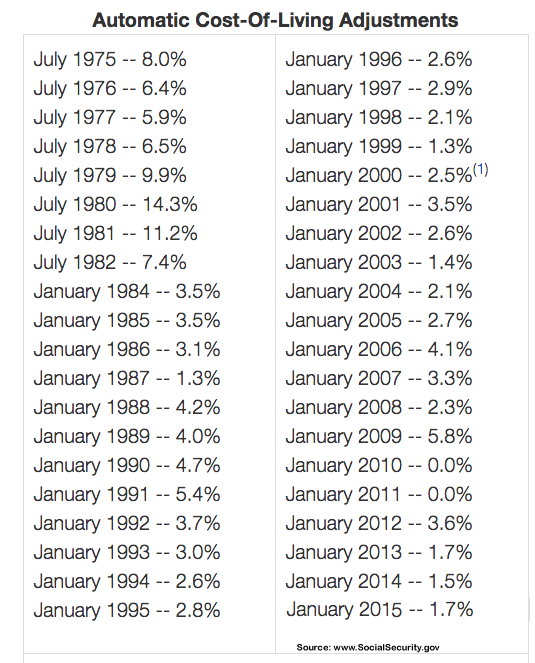 mortality credits while the percentage of interest rate income continues to decrease. And if interest rates increased by 50%, say from long term bond rate of 2% increases to 3%, because rates play such a small role, your annuity income payments would only increase by around two percent. Just waiting a year for rates to climb would do more damage as your age increase and lower deferral period would lower payments more likely than the higher rate would give your income payments. The percentage of your payment linked to credits, meanwhile, continues to grow the longer you live and is often higher than you could achieve through individual investments outside of the annuity. – 25% of any 401k, Defined benefit, 457b, Pension Plan, or 403b also 25% across all pre-tax IRAs, excluding Roth IRA, aggregated together can be invested into a QLAC. That 25% balance is as of December 31st of the prior calendar year. – The cumulative dollar amount invested into QLACs across all retirement accounts may NOT exceed the LESSER of $125,000 or 25% above balance threshold. – The QLAC must begin income payments at the latest by age 85. – The $125,000 dollar amount will be indexed for inflation, CPI, adjusted in $10,000 increments. – The QLAC must provide fixed income payouts; COLA (cost-of-living adjustment) increases are an approved option. – The QLAC can have an optional “return of deposit” death benefit option before the income start date and also have a return of deposit death benefit after income starts. Installment refunds or lump sum death benefits are the two options available. By not having to take the required minimum distribution (RMD) every year after age 70 ½ until age 85 gives the QLAC owner huge tax savings. Lets take a look at an example of a 65 year old purchasing a QLAC this year and starting income at age 85. If the QLAC owner has the maximum IRA balance of $500,000 the prior year then she can invest the maximum limit into a QLAC of $125,000. To compare what the tax savings would be to a QLAC owner the $125,000 balance would be invested into a stock-like investment inside an IRA getting an annual return of 6.9% for this example. At age 70 ½ that initial $125,000 investment would grow to $192,605 and the RMD would be $6,808 for that year. $6,808 RMD taxed at 28% ordinary income tax rate is $1,906.24 due. The next year at age 71 that initial $125,000 investment would grow to $198,627, after taking the previous years RMD of $6,808, this year’s RMD would be $7,268. $7,268 RMD taxed at 28% ordinary income tax rate is $2,035.04 due. This calculation goes on every year until age 85 when the QLAC income payments start. In the example of the 65 year old who deposit $125,000 into a qualified longevity annuity contract will not pay $46,271 in forced RMD taxes for the years 70 ½ until age 85 by transferring that money into a QLAC. Lets not forget about the income payments a longevity annuity contract holder will receive at the income-selected age. In this example it would be age 85. $125,000 deposit into a QLAC delayed income for twenty years would provide $57,107 annually lifetime income at age 85. 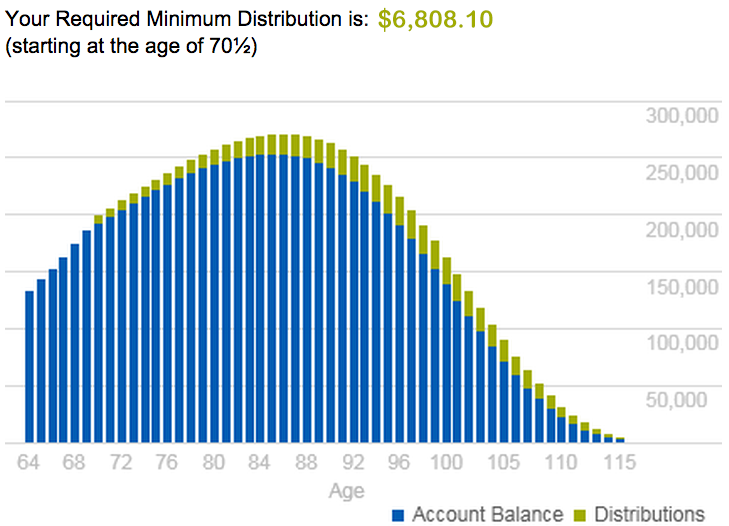 That is a 45% annual payout rate and a total income payment if the annuitant lived to age 100 of $913,719. How to use this annuity in retirement planning? Transferring retirement dollars over to the QLAC saves your income tax dollars for many years as the example above showed. It also gives constant lifetime income to cover your basic expenses later in retirement. Investment research studies have shown that converting a small portion, less than 50%, of your retirement funds to a longevity income annuity such as a QLAC will increase your portfolio income success rate over a 20-year time frame. By eliminating stock market risk with a purchase of a QLAC will produce lifetime income in retirement that cannot be outlived. ADD COST OF LIVING ADJUSTMENT OR NOT? Besides selecting your income start date or age you will have a very important option to include or reject based on your income payments in the future. Cost-of-Living Adjustments or COLA option on income received started with social security in 1975. COLA is an automatic annual increase in payments from 1% to 5% just like your social security income increases. This increase ensure that the purchasing power of income is not eroded by inflation which is running historically under 3% per year for the last ten years (see chart). By selecting your annual increase at application time for your longevity annuity, income payments start off lower when selecting the COLA option. Lets take a look at a real life example. Gary male age 70 deposits $50,000 into a longevity annuity and selects to start income in ten years at age 80 without COLA option. His annual income payment at age 80 will be $10,820 per year fixed until his death. If Gary selected the COLA 3% annual increase option at age 80 the first year payment would start off lower at $9,142 in the first year but increase every year by 3% compounded. See the chart. The next question that should come to your mind is which option is the better choice? It depends on how long you will live or better stated how long you will receive income payments for life. If we know how long we will live then we can calculate the “break even” year of both options. In the above example in year seven the COLA 3% annual payment ($10,916) amount is slightly higher than the constant payment of $10,820 per year. The total income received “break even” is in year twelve where total payments received equal each other. The COLA 3% increase will give more total dollars of income from year twelve on in most cases.